Warrenpoint Town boss Stephen McDonnell. Pic by INPHO. Defeats within a week to Ballinamallard United, Glenavon and Institute cost Warrenpoint on three fronts. Having suffered an Irish Cup final semi-final exit, midweek Mid-Ulster Cup final pain and weekend Danske Bank Premiership defeat, McDonnell is determined to avoid an end-of-season slump. “It was a difficult week but we cannot dwell on the past and it is now vital we do not allow everything to slip away,” said McDonnell. “To even reach an Irish Cup semi-final and Mid-Ulster Cup final should be seen as something positive, on top of the progress made overall. Newry enter the derby date hoping a break from the past can help preserve the club’s senior future. Without a win across three previous meetings with Warrenpoint in the current campaign, Newry know every point could prove vital in the run-in against relegation. Bragging rights for the first time would also offer a boost in the battle to beat the drop. Newry can draw confidence from a 3-0 victory over Ards which moved the City side off bottom spot thanks to a first win since November. 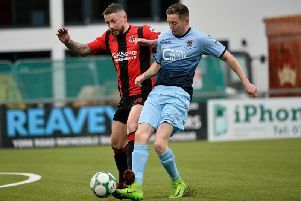 “I’ve family connections to Warrenpoint and used to play for the club, so know how important the derby is on both sides,” said Newry coach Gary Boyle. “But we also want to push on from the Ards win and really build off that result.